For busy go-getters, staycations can let you take a much-needed break without spending too much time away from work. And for those seeking an adventure or unique experience beyond just accomodation, these hotels offer just the thing. Here are eight affordable hotels with great staycay options that won’t break the bank! 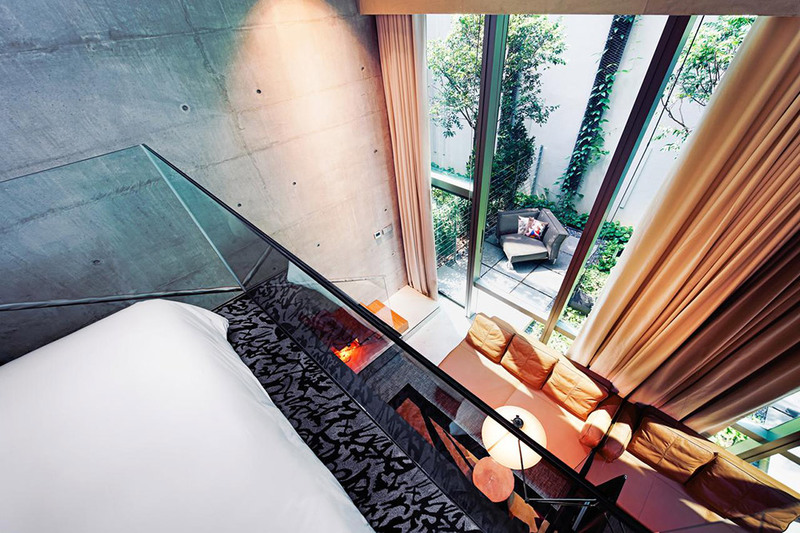 Studio M is the first hotel to offer loft-inspired designer rooms. A popular destination for birthday parties, photoshoots and staycations, Studio M offers amenities like an open-air gym or a jet pool for a full therapeutic experience. The rooms, priced at $160 a night, boast high ceilings and white aesthetics that give off an air of chic luxury, while the flat screen TV maximises the comfort of lounging in bed. 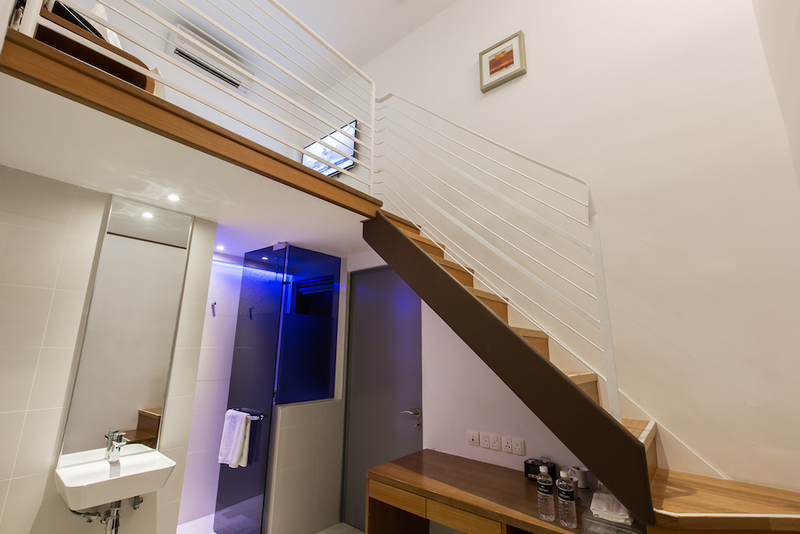 Located near Fort Canning station, Studio M is accessible and also close to great restaurants along Boat Quay. The hotel also provides great backdrops for Instagram shots – check out their deck and 23m pool! A sister branch to Studio M, M social was conceptualised with parties and staycations in mind. With outdoor patios attached to the loft-inspired rooms, M social is designed by award-winning interior design artist Phillippe Starck. 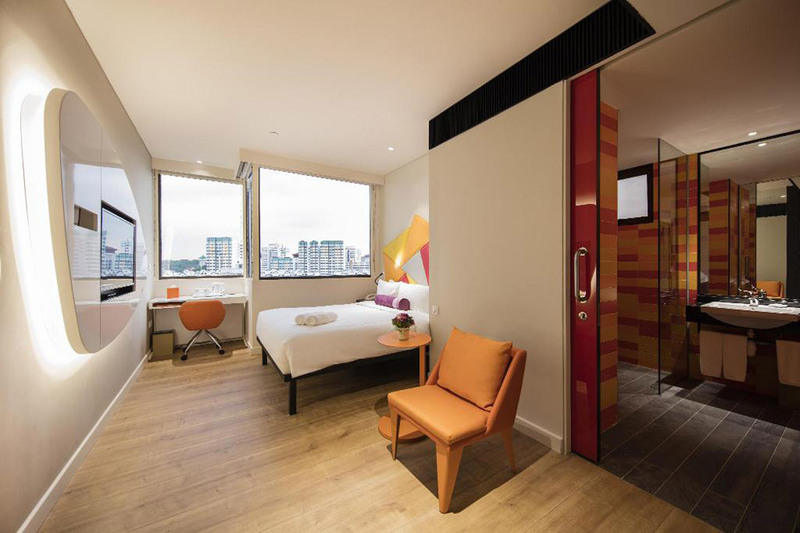 Rooms like the one pictured above are priced at $160 a night, and have stunning views of the Singapore River while being just a stone’s throw away from Clarke Quay. Rated as best value in the area, M social prioritises a no-fuss customer experience with a self check-in counter. The pool and restobar provide relaxing alternatives for those wishing to take a quick stretch outside of the room. Champion Hotel is the dark horse in the staycation arena. 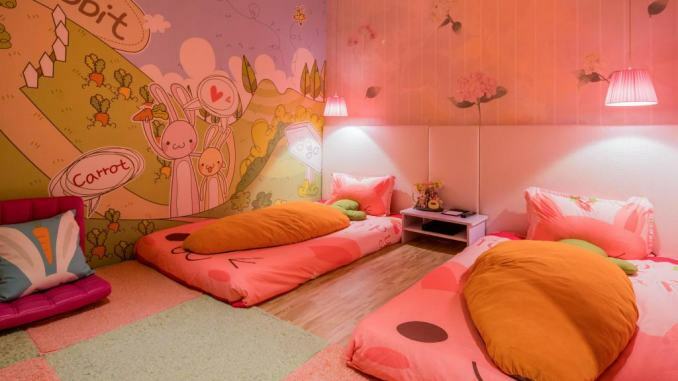 With concept rooms like this cartoon room, be prepared to take some insta-worthy shots. The concept room can be yours for the night for $114. The whole hotel has different aesthetics to match your mood of the day, including tatami rooms or rooms with a cosy swing chair. One of the most affordable locations, it is also conveniently located near Esplanade MRT Station. Take a walk down Joo Chiat road for dinner and eat some of the best local food! 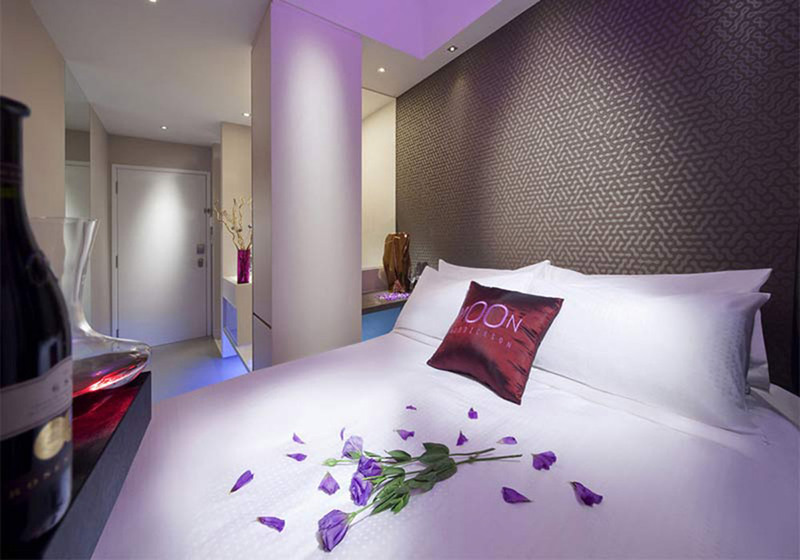 Moon 23’s concept of openness and natural themes shines through with the use of flower petals and wallpapers of popular tourist destinations.The above room is priced at $140 a night. Just as the name suggests, the place comes to life at night with blue lights that are easy on the eyes and complimentary beverages served all day long in the lounge. Minutes away from Jalan Besar MRT station, the hotel is near great shopping haunts like Bugis and Mustafa Shopping Centre. If you have the budget to spare, book a stay in their famous moonlight suite that’s equipped with an outdoor bathtub and shower! This deluxe double room is priced at an affordable $140 a night, with a large king bed and a floor-to-ceiling balcony view. For the urban dweller, Hotel Yan is perfect with its rustic decor that rings true to Kallang area’s industrial heritage. Feel luxurious with the rain shower and bidet that’s a rarity in budget hotels. Located near Lavender MRT station, Hotel Yan is close to shopping hubs like Bugis and free attractions like the National Gallery. Unwind over the weekend with a comfortable Sealy mattress and a great view! 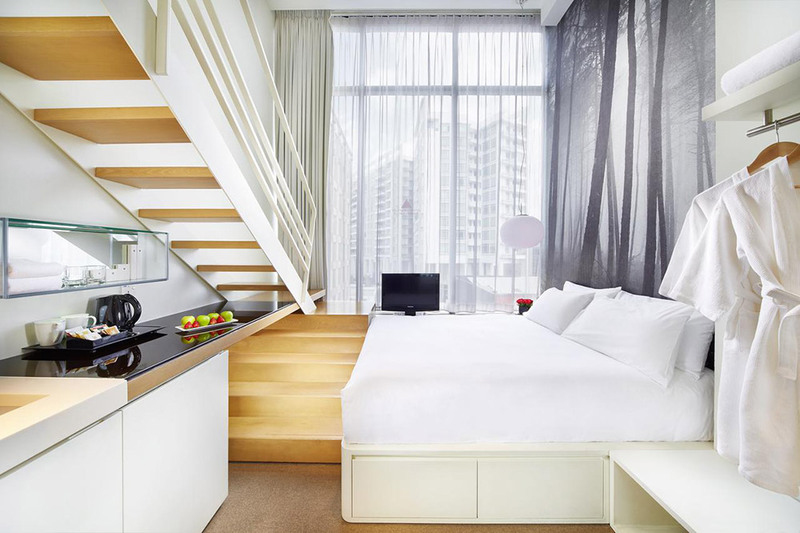 ibis Styles Singapore on Macpherson is a budget hotel by Accor Hotels, which also owns luxury hotels Sofitel and Pullman. The ibis Styles’s sleek cruise-theme pairs well with the colourful decor around the hotel. Their pool bar, Chat & Chow, serves up an array of international cuisines next to their gorgeous pool. Customer service is of utmost priority at this hotel, with shuttle buses to Orchard and Outram Park MRT stations. Check out the food at the nearby Geylang Serai Market, and then spend the night in their standard queen room at just $117! 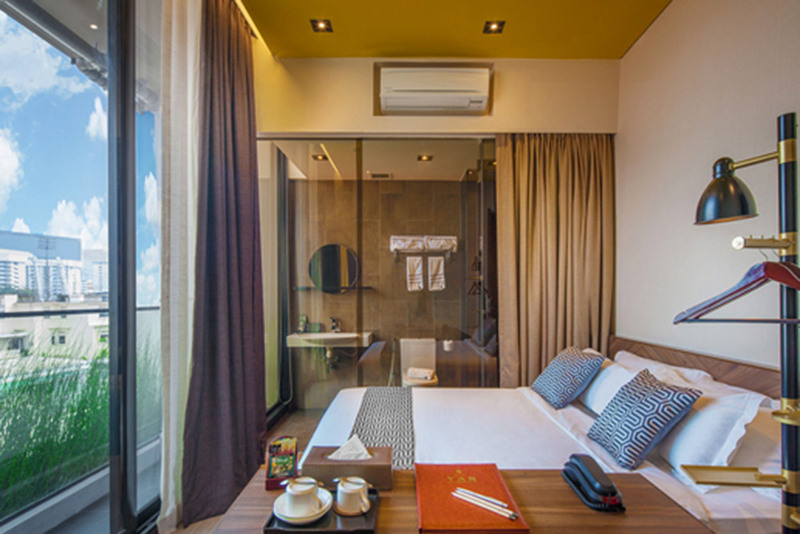 Stylish lofts are just one of the rooms that Arton Boutique Hotel offers. This boutique hotel offers the Queen Loft for just $137 a night. Here’s a tip – book through their website to get the best rates and also a complimentary late checkout. Each room is equipped with a 42-inch TV, right in front of your cosy queen bed. Hook up your Netflix with an HDMI cable and you’re off to a great night! Located 1km away from Farrer Park MRT station, Arton Boutique Hotel is also a stone’s throw away from Mustafa Centre. Check out this cosy place out for your next staycay! 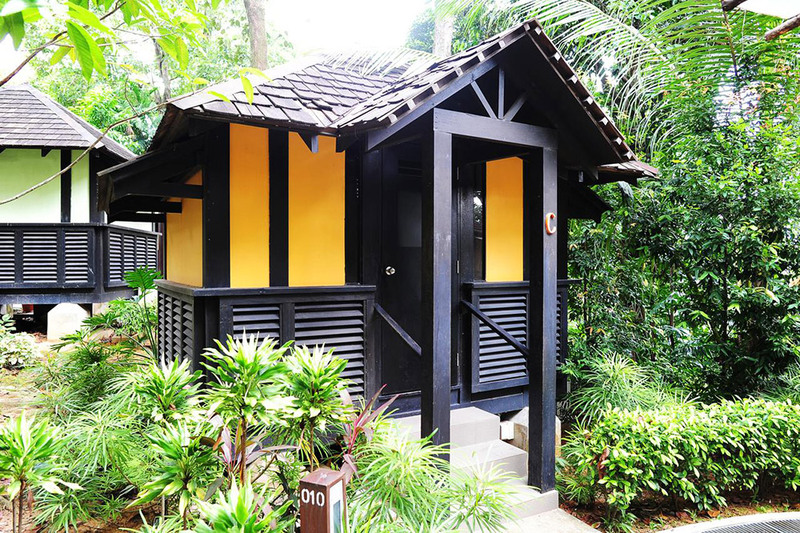 For adventure seekers looking to escape Singapore’s concrete jungle, Costa Sands Resort offers a throwback to the past with their Kampung Huts. With access to barbeque pits and billiards tables, these kampung huts foster an atmosphere of homeliness and cosiness that resembles 1960s Singapore. Perfect for groups, Costa Sands Resort is a minute’s walk from Siloso Beach, where you can enjoy a fun afternoon under the sun. Don’t worry about accessibility as there are regular complimentary shuttle services to the resort from Vivocity. Looking for something different for our staycation? Why not blast to the past at these Themed Hotels In SIngapore .